Grady-White Boats got its start in the Old Star Tobacco Warehouse No. 2 on Albemarle Avenue in Greenville, North Carolina. The company was founded in 1959 by entrepreneur Don White and boat builder Glen Grady. The fledgling business offered two boat models—a 16-foot and 17-foot runabout. They shipped their first four boats in February 1960 and Grady-White employed 38 people at the time. “The lap-strake mahogany boats developed a reputation for quality and seaworthiness. They were beautiful. They were functional. But, in spite of the boats’ appeal and acceptance, the company was in financial trouble within a decade,” explained Shelley Tubaugh, vice president of marketing at Grady-White Boats. True to his word, Smith did his research and hired the most qualified engineering and manufacturing experts to set up an efficient manufacturing process. They set up a standard cost system that included time and motion standards to measure the efficiency of individuals and the boat building process. In 1968, while virtually unheard of, Grady-White hired a computer expert to design a materials requirement plan to keep track of materials. These tools, and others used in current day manufacturing operations, catapulted them ahead of the entire boat building industry. The company became more efficient and lean and started to grow quickly. That’s when Grady-White turned to the Economic Development Partnership of North Carolina (EDPNC), a partner of the North Carolina Manufacturing Extension Partnership (NCMEP), for personalized assistance to address its expansion needs and coordination of resources. Tim Ivey, director of regional operations, Northeast zone, for the EDPNC, got to work right away. He was able to find assistance for the project from several North Carolina agencies including the North Carolina Department of Commerce’s Rural Economic Development Grant program, matching funds from the Pitt County Development Commission as well as funds for educational credits for training at Pitt Community College. 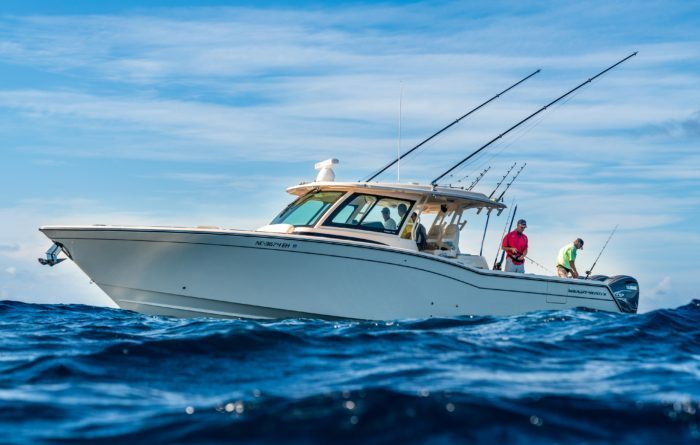 Grady-White has come a long way since those days of offering two models of their lap-strake mahogany boats. Today, they build 27 models of fiberglass offshore, sport fishing and family fishing boats ranging from 18 to 45 feet. They presently employ about 350 people. Grady-White’s 60-year track record of pioneering designs, leading craftsmanship, exceptional engineering and unparalleled customer satisfaction has earned them 17 out of 17 customer service awards from the National Marine Manufacturers Association (NMMA) Marine Industry Customer Satisfaction Index. This is an abbreviated version of an article written by Teresa Bradford, director of marketing at the North Carolina Manufacturing Extension Partnership (NCMEP) and NC State Industry Expansion Solutions. The full article, originally published on NCMEP’s website and republished with permission, is available here. NCMEP is the official representative of the MEP National Network ™ and NIST MEP in North Carolina. The MEP National Network is a unique public-private partnership that delivers comprehensive, proven solutions to U.S. manufacturers, fueling growth and advancing U.S. manufacturing. Interested in growing your business in North Carolina? Find your regional industry support manager here, or call 919-447-7744.